Congrats on winning, he’s a keeper. were so clutch this postseason despite his moves. @raffi Go play with yourself to your Jeter VHS tapes. Maybe to help assure free agents they are going to work with a manager who creates a good work environment. He deserves a huge raise! Big difference between Cora and Farrell. The demographics of players has shifted over the years to Latin America and beyond. I don’t see it going away, I see it increasing. More managers like Cora are in the pipeline. That plus some combo of analyitics & gut feeling skippering is going to bring other young teams to post season baseball. Get the owners out of baseball who haven’t got a clue or don’t care. Eventually expand to 32 teams & 4 divisions. Let’s put baseball in high gear. There aren’t enough decent pitchers for the 30 teams we already got. They were saying the same thing ever since MLB starting expanding beyond 20 teams. Going to 32 will probably make scheduling easier. MLB needs to drop back to a 154 game schedule again also. You knew there was going to be at least one idiot make it about race SMDH. How did Houston win with their white manager and all those Hispanic players? Crazy! While I am for expansion, I think the pace of play is going to be a factor in getting youth more interested in baseball and I haven’t got the slightest clue on how to speed the game up. I’d like to see a Sunday doubleheader a few times a season for each club too. They tried that with Farrell and it didn’t work out. 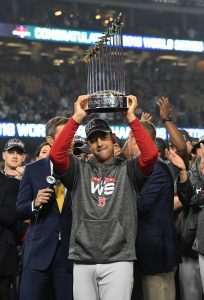 Name a Player that made a Huge Difference for the Red Sox besides a (close) Triple Crown Candidate JD Martinez. Eovaldi? Mid-Season Trade. WS MVP Pearce? Also a Mid Season Trade. Your logic is good if you discount the value of team chemistry entirely. The players HATED playing for Farrell. They were(admittedly) miserable. Betts and Bogaerts(among others) vastly underperformed during Farrell’s last year. You are right that JDM made a big difference, but Cora did a great job managing the egos and making the game fun again. Don’t discount that. They say a guy like Joe Maddon helps recruit players to the Cubs. If that is true, Cora is going to help recruit guys to Boston. He might even help retain some guys that are already there. He was a breath of fresh air this year. He made all the difference in the world compared to the previous miserable/stuffy regime. Totally agree. And players talk amongst themselves too. They’ll all vouch for the good vibes. To be sure, he was handed the keys to a pretty fast car, but those players were loosey goosey all year. They were having a blast and i think that reflects well on Cora. Glad he’ll be around. Wait, I thought it was easy when you have the biggest payroll in baseball? Like the Yankees never had that!!! Stop Crying!!!! You might as well just put a large hand up his @$$. He’s a puppet for the front office analytics team. Still staggering the difference in managerial hires between the Red Sox and Yankees. The Red Sox hired a guy who checked every box, including dugout experience with the previous WS champs. The Yankees hired the guy who sat next to Jessica Mendoza on Sunday Night Baseball and never said anything particularly interesting or insightful while doing it. No disrespect to the A’s….but…. Cora should have taken manager of the year honors. The turnaround he helped produce for the teams chemistry was epic. Yes, I was outraged to see that Alex Cora did not get the manager of the year. Guess Melvin was the making lemonade out of lemons pick. His ability to relate to all players was/is his strong card. Not one player this past year said anything negative that I can recall. Winning from day one helps though. Little League coach could have manage this squad get real people if you have the horses all is good and being on top is where you should be.